Apparently the circumstances for the preparation of Plan B, “Deng Xiaoping’s Option,” came together over the past two years. Kazakhstan’s authorities have prepared well for the transition period. They have created many formal legislative and informal political “safeguards” to ensure the stability of state mechanisms after Nursultan Nazarbayev’s departure from government affairs. However, there is a problem with this approach. The main goal of Plan B is continuity. How can continuity be combined with the demand for change? This question is reviewed by Ivan Safranchyuk, associate professor of World Political Processes at the Foreign Ministry’s MGIMO University and member of the Council for Foreign and Defense Policy. Over the past ten years Nursultan Nazarbayev has had two strategic opportunities. The first was to occupy the presidency, maintaining his involvement in current government affairs (The amendments introduced into the Constitution in 2007 allowed Nazabayev as the first president to be elected any number of times by way of exception from the general rule of two presidential terms). The second was to follow the path of Deng Xiaoping, that is, to resign the highest post and distance himself from current affairs but retain the levers of power for blocking strategic decisions that run counter to his will (Leader of the Nation status, the foundation for “Deng Xiaoping’s Option,” was legalized in 2010). Having these two strategic opportunities, Nazarbayev chose the first – the presidential post and involvement in current affairs. Since 2010 he has won two presidential elections (in 2011 and 2015), changed governments (during this time Kazakhstan had four prime ministers), has announced ambitious government plans, and has endorsed national development programs. All of this showed that Deng Xiaoping’s Option was considered to be Plan B. However, it was unclear in what case and under what circumstances it could be used. The Security Council was reformed in the first half of 2018: its status was upgraded  and its powers expanded . The main thing is that Nazarbayev became the head of the Security Council for life. In June 2018, Kasym-Zhomart Tokayev expressed his personal opinion in an interview with the BBC. He said Nazarbayev would not run in the 2020 presidential election. So the first half of 2018 can be unequivocally interpreted as practical preparations for Plan B, i.e., Deng Xiaoping’s Option. But how can the 2017 constitutional reform be interpreted when some powers were transferred from the president to parliament? Amendments to the law on a presidential election were made at the same time, toughening the requirements for presidential nominees (they are now required to have at least five years of experience in government work and be recommended by public or party organizations. These amendments basically made it impossible for an independent opposition nominee to run in the presidential race although this was hardly likely anyway. What happened? Did they want to relieve some of the burden from the presidential post? Did they want to further protect him from his rivals to enable him to continue fulfilling his duties? Or, was it actually the beginning of the transition to Deng Xiaoping’s Option? The departure of Nazarbayev is undoubtedly a carefully thought-out and optimal political step. Nursultan Nazarbayev resigned as president in a political environment that was calm and prepared, while retaining the main levers of power. Apparently, the circumstances for the preparations for Plan B took shape over the past two years, but when exactly this happened and what happened is not public information. As far as we can see, Kazakhstan’s authorities prepared well for the transition period. 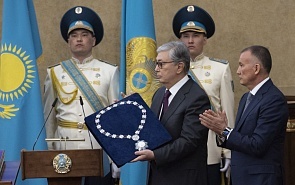 They created many formal legislative and informal political “safeguards” to ensure the stability of state mechanisms after Nursultan Nazarbayev’s departure from government affairs. However, this leads to a problem. The main goal of Plan B is continuity. (This is why he is compared with Deng Xiaoping). How can continuity be combined with the demand for change? The host of divergences that have accumulated in Kazakh society are giving rise to this demand for change. This is not a demand for any specific change (such as a specific political, social or economic program) but a demand for an opportunity to resolve one’s own divergent problems. This demand exists in society. It also exists among the elite, but it is not that pronounced because of the need to demonstrate loyalty and because of fear of change. With Nazarbayev’s departure from government affairs, the preservation of continuity is a priority for him and his close entourage, whereas for society, and a considerable part of the elite, it means an opening for new opportunities. In theory, these are no mutually exclusive priorities, but practically, it is hard to combine them. This is a common problem for the Central Asian countries. Aside from President Emomali Rahmon of Tajikistan (who came to power during a civil war and whose case remains unique for this reason), the heads of state have all changed in the other countries in the region. This happened twice in Kyrgyzstan during street protests involving, in part, the elite, so continuity was not an issue. But successors came to power in three other cases. Each time, a successor, that seemed loyal before, initiated serious change and engaged in reshuffling if not a purging of those associated with the former president (as with Saparmurat Niyazov and Islam Karimov in Turkmenistan and Uzbekistan, respectively, and Almazbek Atambayev in Kyrgyzstan). The point isn’t that Kazakhstan is better prepared for “Operation Successor,” and will be able to carry it out without allowing serious inter-elite divergences, as distinct from Turkmenistan, Uzbekistan and Kyrgyzstan. It is noteworthy that in the three latter countries the new presidents not only restructured the inter-elite balance to suit themselves but also set forth political, economic and social initiatives that ran contrary to those of their predecessors. They had to do this because of the accumulated demand for change. Society must accept the first person even if there is no real competitive election. The mechanismsof legitimization that were accessible to the first presidents are not within reach to their successors. They must attract the public with something and give them hope for a better future. This happened in Turkmenistan where after “the era of the golden age” (the last official ideological concept of Niyazov), Gurbanguly Berdimuhamedov announced “the era of revival”; the same happened in Uzbekistan where Shavkat Mirziyoyev, who was prime minister under Karimov for 18 years, initiated economic and administrative reforms that seriously diverge from the previous policy. In the Central Asian countries the head of state partially allows and partially removes the continuous and inevitable differences among the elite and society, and compensates for the lack of solutions by toughening his regime. This leads to the accumulation of divergences that are largely invisible to an outsider but well known by the elite in the given country. The elite themselves initiate major reforms after the first leader leaves office. Therefore, it is reasonable to question the elites’ loyalty to the first person of a state, and it’s usually conspiratorial. Moreover, a long stay in power, even without major excesses, could point to accumulated internal divergences rather than sustainable stability. Incidentally, there is an example of relatively conflict-free continuity in the post-Soviet space. Azerbaijan, with its experience of power transfer through the family line, kept the main parameters of the political and economic system. True, during his first presidential election in 2003 Ilham Aliyev faced serious street protests and changed the inter-elite balance in his favor in the years that followed (the intensity of the inter-elite struggle is evidenced by the announcement that a coup was thwarted in 2005, which was followed by the arrest of many former high-ranking officials). Kazakhstan’s experience will be unique. It will likely avoid the risks in Nazarbayev’s departure from current government affairs. However, the afore-mentioned problem of combining continuity with the demand for change will remain. Unconventional government abilities will be required to resolve it. It became a coordinating constitutional body rather than a consultative one as before. The Security Council reviews the main areas of government policy on national security and defense capability and coordinates the activities of government bodies and organizations in these areas. The government is accountable to it on national security issues. But the Security Council also has powers on personnel issues. It reviews the nominees recommended as heads of central and local executive bodies of other regions and cities of republican significance and the capital, as well as government bodies that are directly subordinate and accountable to the President of the Republic of Kazakhstan.